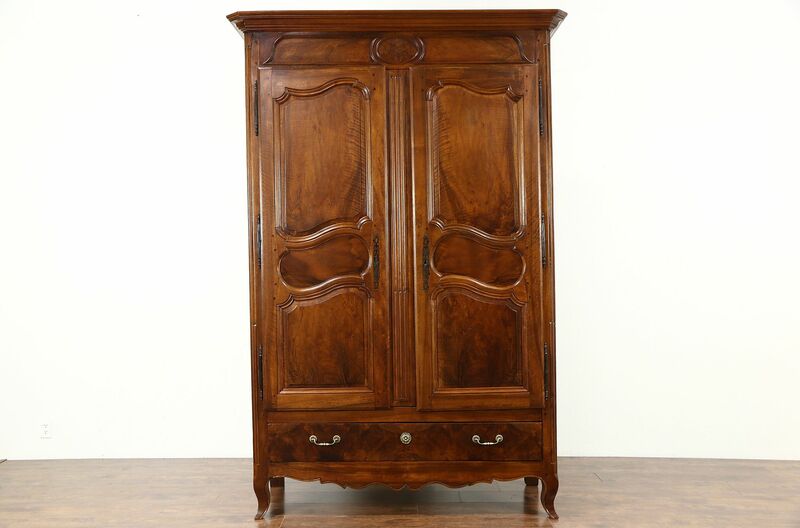 A traditional armoire or wardrobe was hand hewn of solid walnut in France about 1825. The restored finish is in excellent condition on this Provincial antique furniture. Carved square pegs at the joints are authentic. Doors have original lift off hinges, escutcheons and a working giant lock and key. The drawer has hand cut dovetail joints and later hardware. The interior was fitted with shelves, part of the back was removed and cable holes were cut to use as an entertainment center. Shelves and the crown are screwed on but removable. Shaped and raised panels are classic. Measurements are 65" wide at the crown, 8' 1/2" tall, 27" deep and interior depth is 22 1/2"